Copyright © Colección Mineralógica Instituto Canarias Cabrera Pinto – La Laguna – Tenerife – Spain. Copyright © Colección Mineralógica Instituto Canarias Cabrera Pinto – La Laguna – Tenerife – Spain. - This image is copyrighted. Unauthorized reproduction prohibited. 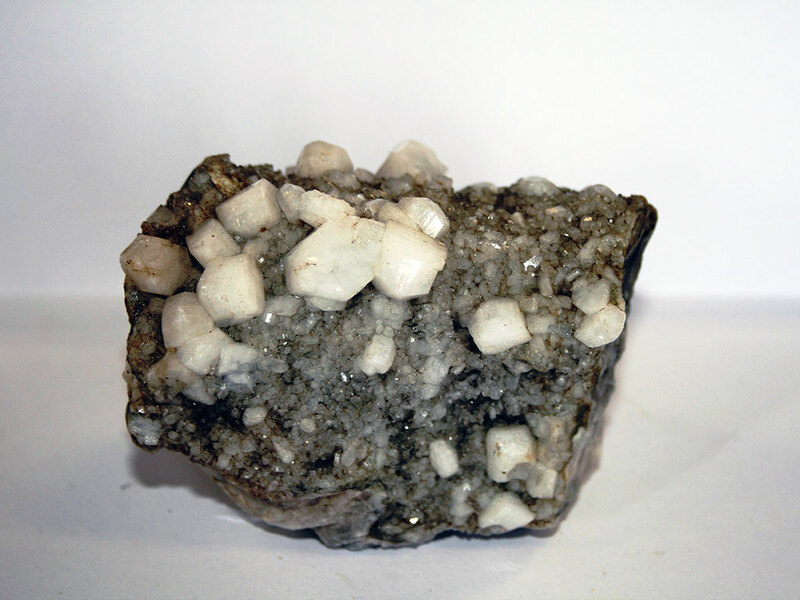 Large prismatic crystals of Harmotome grown along with other smaller of Brewsterite-Sr; this is the typical paragenesis of these minerals from the group of Zeolites rich in Ba and Sr accompanying the ore in the old mines located around the town of Strontian. It comes from the old House Eloffe from Paris (about 1850) and is part of the collection of 115 minerals of higher quality (Mineraux choisis) sent by this dealer to our Institute. Grandes cristales prismáticos de Harmotoma crecidos junto a otros más pequeños de Brewsterita-Sr; se trata de la paragénesis típica de estos minerales del grupo de las Ceolitas ricas en Ba y Sr que acompaña a la mena en las antiguas minas situadas alrededor de la localidad de Strontian. Procede de la antigua Casa Eloffe de París (sobre 1850) y forma parte de la colección de 115 minerales de mayor calidad (Mineraux choisis) enviados por este proveedor a nuestro Instituto.